Posted by scottstoel on May 25, 2011 at 4:11 pm. One of the challenges in a font-based workflow is the difficulty determining what fonts are used in a document without launching the document. Many times in InDesign you can use the Package command, which will save a report of the assets used in the creation of the document. This command is commonly used when collecting document assets for a service provider, but not used in most designer’s day to day operations. Unless you integrate that feature into your workflow, you are required to launch InDesign, open the document, and use the Find Fonts command to access a comprehensive list of the fonts used in the document. Depending on the size of the file, this can take a while. 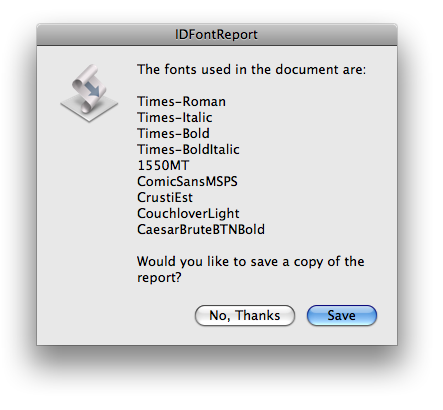 If your document uses many fonts the Find Font dialog window does not expand so you can easily examine the whole list. AppleScript offers us another way. 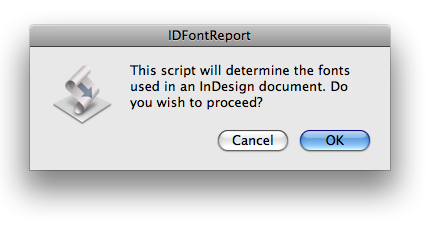 In this post we are going to instruct you on how to use a script we developed at FontGeek that allows you to get a list of all the fonts used in an InDesign document without having to launch the document, or even have InDesign installed on your system, and then save a report if you wish. First download the compressed AppleScript application here, then unzip the file. Click OK and the script will search through the InDesign document, gather the fonts used into a list and display them for your examination. At this point you can dismiss the dialog, or save a copy of the report to the location of your choosing with any name you wish. The report can be read with most any text editor. This script does have some limitations, such as only processing one document at a time. Also if no fonts are used in the document, the script simply lists no fonts. In short, this script could be made both “smarter” and “prettier” but it is still a very useful tool to bring more transparency to your workflow. The script is provided as is, which means you are using the script at your own risk, and I will not answer emails for support. I am happy to answer any questions you might have and you can reach me at my email, scott@fontgeek.net. Stay tuned to FontGeek for more about using AppleScript to automate font-related workflows.